Cash flow forecasting is a key aspect of personal finance planning, that deserves special attention if you want to reach financial security and be able to foresee any potential money shortfalls. Cash flow is the lifeblood of any business or businesses and predicting your company’s future cash requirements is essential if you want to stave off a financial crisis before it hits you. The same principles equally apply to personal finances. While it’s important to track expenses and see where your money has gone, it’s even more vital to know that you’ll have enough cash coming in to cover all your expenses when they fall due. There are countless reasons why cash flow forecasting is so important, but this by far tops the list: think of it as your “early warning system” that allows you to predict what is going to happen to your cash flow over a specific time frame and take advance measures in case you see a financial disaster coming. As an essential part of personal finance planning, you should perform cash flow forecasting in combination with an analysis of your historical trends on income and expenses and monitoring of your monthly budget performance over a certain period of time. Whereas budgets are based on your active plans for the future, a cash flow forecast is an estimate of future projected income and expenditures based on your past experience. Forecasts are necessarily driven by assumptions and for the forecasts to be realistic and hence useful the underlying assumptions must be as reasonably accurate as possible. 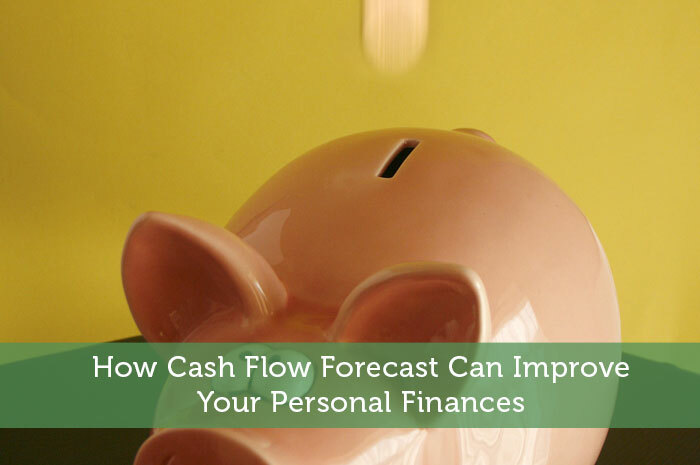 Cash flow forecasts can be as simple or complex as your financial needs dictate. Most families have regular monthly fixed inflows and outflows of cash that are easily identifiable and can be projected more or less precisely, for example: monthly salary, pension, interest (for income) and household costs, food, car, insurance (for expenditures). It is the irregular payments that can cause problems while reconciling your actual results with your forecast, that’s why it’s important to include any likely changes in your family’s future budget while applying historical data to your forecast. Making cash flow forecasts is like modeling your financial future, therefore you should be careful with the information you use to build your models. A cash flow forecast is usually projected over a period of six or twelve months, although weekly, monthly or quarterly forecasts tend to be more realistic than long-term projections. It’s better to use a personal finance management tool to gather statistical data on your spending or saving habits. It is your “crystal ball”: cash flow forecasting makes it possible for you to get a glimpse of your financial future before it happens and promptly react to any possible dangers. It gives you advance warning on potential money problems. You can efficiently use the available time to work out solutions to overcome the anticipated financial troubles without having to overstretch your budget. It helps you predict upcoming cash surpluses that can wisely be used towards your financial goals or to make profitable investments. It provides key data for “what if” modeling. You can run various “what if” scenarios, assess the changes in your cash balance and readjust your forecast based on the results. Testing different strategic scenarios will help you prioritize your needs and make better money management decisions. Cash is king, but so is knowledge. Although it’s based on assumptions and predictions, cash flow forecasting nonetheless provides valuable insight into the likely future evolution of your personal finances. Try out some online sites that provide this service or search for cash flow templates that can help you start your forecasting. Cash flow forecast is a powerful money management tool that encourages you to plan ahead, prepares you financially for what the future holds and ultimately helps you improve your personal finances. We do a modified cash flow analysis ourselves. It can be immensely helpful to see where we are at in terms of our cash flows and helps us make decisions quicker. I should probably do a better job of planning cash flow since I usually keep too large a buffer in my bank account. It would make decision making a lot easier. It’s much easier to take important financial decisions in real time when you can quickly pull all relevant data from your cash flow forecast. We definitely look at cash flow. It helps us know how much we have left and determine if we truly need something. It’s a better way of planning than just resorting to credit cards and hoping you can pay it off. So really more people should keep better track of their cash flow. Cashflow, often a neglected term when it comes to your own finances, but almost as vital as spending less than you earn. It’s amazing how much difference it can make to your life by simply planning things out first. It does ensure that you are not charging more than you can really afford. If you don’t do that kind of planning, it’s far too easy to overspend without even realizing it. More importantly, cash flow forecasting can help you understand how much you can really spend in the future without stretching your budget too much. When you spend according to your projected cash flow model, you won’t be tempted to make unnecessary purchases that could burden you financially and lead to debts. I do forecast as much as possible although life is pretty unexpected right now. In conjunction to an emergency fund it helps me weather the storms down the road. The more information you have beforehand the better. Yeah, you know like the saying goes: “Forewarned is forearmed”. The more information you have at your disposal to rely upon, the higher the chances that you’ll make the right decision, even when you are facing some unexpected situation. Most people don’t think of cash flow, nor do they think of doing an analysis of their cash flow. If you have ever run a business, then you are all too familiar with cash flow. I started doing this about 2 years ago and it is quite insightful. Cash flow forecast is vital for any business, regardless of its size. It’s sad though that some families simply disregard cash flow forecasting while planning their family finances, since it can become a powerful tool with many benefits. Good article! It’s easy and I’ve often forgotten to do cash flow forecasting. I might do it in my head but this isn’t as accurate and reliable as putting it down on paper and part of my budget. Lol, my wife and me are pretty old shcool I think. I didn’t know that this kind of thing had a name even. Cash flow forecasting. Much less that it had online tools or peopel you can pay to do it! My wife does most of our finances, but it’s just a regular part of paying bills to look at where we’ve been, what’s coming and what to expect, and stuff. It’s funny to me when things that we just do normally and think nothing of, have names and websites and tools…. Nowadays there are online tools almost for everything. They can make our life easier, and the results are much better when you yourself proactively engage in managing your family finances or projecting future cash flow. Of course you can pay an expert to do this for you, but nobody knows your financial situation better than you. There’s nothing like being able to see into the future to prepare your finances, Nice post! Yup. I never used to have problems with money when my income was regular, but now that it comes in fits and starts, it has been a little harder to follow even when I know I’ll have enough to pay the bills. Budgeting becomes that much harder, and building up a safety cushion is a priority. You are absolutely right. Managing and following a budget based on an unsteady income becomes an even bigger chore. Building a nest egg under such circumstances may be a challenge, but if you know how to prioritize your needs you’ll be able to put some money aside each month. I also look at cash flow for the future and tend to be very modest in my predictions, assuming almost no raises in income and the highest expenditure possible. This allows me to never fall short, but almost always ahead as I will always keep my expenditure lower than my predictions and prepared if something unexpected happens. That’s a great strategy. The most important thing in cash flow forecasting is to be realistic about your finances. Never set your expectations higher than what your real financial situation dictates, otherwise your actual results will never match your forecast and you’ll get burned. A cash flow forecast should be built on statistical data and not on someone’s personal vision of his financial future. I absolutely forecast/plan as much as I can in advance. I’ll set up my monthly budget sheets at once for the entire year, and I’m always tweaking things so I have an accurate picture of my entire financial situation. It’s imperative to make adjustments to your cash flow forecast and account for any unforeseen changes in your financial standing, especially when your projection covers a long time span. The more accurate your forecast is, the higher the chances that it will meet the expectations you have about your financial future. We are always looking at cash flow past and present and predicting what we will need or need to have ready to pay bills. We look at projected expenses and make sure they are factored into the monthly budget and are saved for those future expenses. Having the budget is great what is more powerful is the data to analyze and use. Great post. You are right! Budgets are a powerful tool enabling you to control current spending, while cash flow forecasts namely focus on the future evolution of your finances. Moreover budgets generate valuable statistical data about your spending and saving habits, that should further be integrated into your cash flow model. This is always something I consider whenever making a major purchase. Knowing if you’ll be able to make payments can save you a lot of heartache down the road. Did I write this? lol This is exactly the system we do. Back when our income was razor thin over our expenses. Knowing our projected cash flow was the only thing keeping us from overdrafting our account. Thinks are much better now, but we still do it. I’m glad you still do cash flow forecasting. It can be equally efficient for both categories of people: those who struggle financially and those who are financially fit. It’s just that they have different reasons for wanting to do a cash flow forecast, and thus the approach is also different. A tool or a website that handles cash flow forecasting for you, that’s a good service. Companies do cash flow forecasting every quarter to analyze the ins and outs behind the cash management. I had a friend who worked for a cell phone provider and they have cash flow forecasting for every month based on what future customers were expected to jump ship after the contracts were due. That makes a lot of sense that a cell phone company would have to do that every month. With the high level of competition they can’t just assume that their revenue will keep coming in at the same pace every month. On anniversaries of special promotions they probably end up getting a high level of turnover. I am mastering the basic cash flow forecasting for now but really have a hard time with the more complex stuff. Hope I will get better at it but it’s not as easy as it sounds to predict your financial future. It would vary a lot depending on whether you are an optimist or pessimist. I guess you plan for both the best case and worst case scenario. Ideally you have an emergency fund available in case things do turn sour. Just as in small businesses cash flow can cripple a personal finance situation. Cash management for people with complex finances is even more important. For me I don’t do it and don’t know if there is a lot of value in it but for people with rental properties etc it would be a must! Good example Jon. Having rental properties or similar side hustles does create a real need to have extra cash available just in case. A larger family with bigger expenses is another case where managing cash flow is more important. For some people though, it isn’t a big deal to essentially wing it when their finances are relatively simple. Personally I would charge all of those expenses to a credit card to get the cash back rebates and extra buyer protection. It’s still important to have the cash available to pay all of those expenses in a timely manner. This is what is missing from most budgeting apps/websites. Just creating a budget from some total monthly amount isn’t really enough in my opinion. Forecasting makes it so much easier to manage your bills because you all you have to focus on is your bank balance. If that balance isn’t RED in the future, then you are doing ok. That tells you whether you will be able to save more or whether you need to move some things around. There are very few websites that offer this. The problem, I think, is that most people just don’t know what forecasting is and how it works. Once you do it, you are hooked! I switched to the forecasting method when my wife convinced me to switch to her forecasting budget sheet. Before that, I used my own, where I would allocate 1/2 of all bill amounts every time I got paid. The forecasting method was superior in every way. Some apps that offer this feature are PocketSmith, Kualto, and CalendarBudget.